Perth’s premier classic motoring event turns 50! 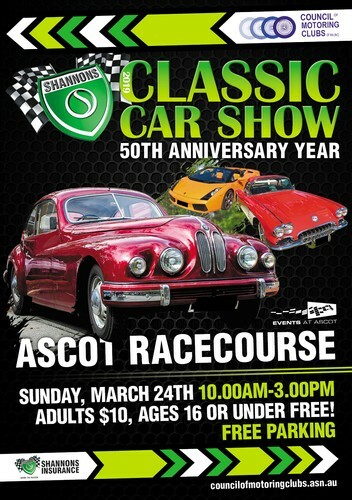 The Shannon’s Classic Car Show, the one event that brings Perth’s varied motoring clubs together in the one place, started with a small gathering of five British car clubs in 1969. Since then the show has grown and now showcases vehicles from more than 70 clubs, ranging from trucks, buses, vintage and classic cars, sportscars, motorcycles, scooters and microcars. This year we expect to see approximately one thousand vehicles on display in the pleasant grounds of Ascot racecourse. There will also be displays by special interest clubs, such as the vintage radio society, activities for children. Food and refreshments are available and Kalamunda Community Radio will be playing classic tunes and broadcasting live from the show. It’s a great day out for the whole family. Children under 16 (accompanied by adult) enter free. Free parking onsite. Gates open ‪10am and close ‪at 3pm.